The number of flying electric airplanes (and pilots) increased by one with the first flight of John Monnett’s Waiex in Oshkosh, Wisconsin. 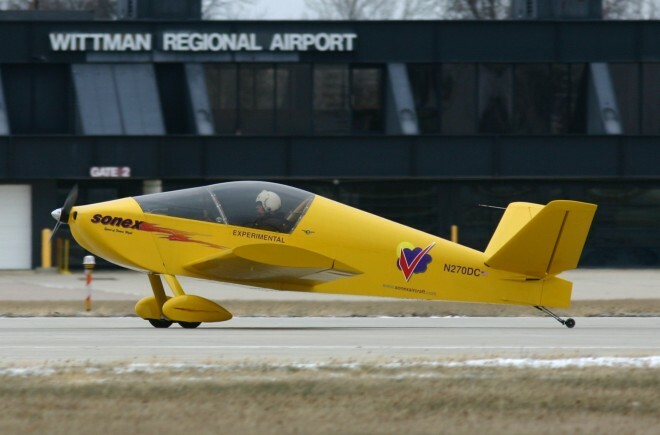 The Waiex is one of several models of kit-built aircraft designed and produced by Monnett’s company, Sonex, and the electric version has been in development for several years. The flight was a very short one, just a quick hop out of ground effect down runway 27 and back down to the ground a handful of seconds later before reaching the end of the runway. The company says the intent was to fly a conservative, short flight down the runway to check the performance of the systems before expanding flight testing further. The airplane is a standard Waiex kit aircraft modified with the electric power system. The airplane currently has a 54-kilowatt brushless DC motor and a 14.5-kilowatt-hour lithium polymer battery system. In addition the company has also developed its own battery-management system, motor controller and cockpit instrumentation. In the video below there is the now familiar sound of a whirring propeller making most of the noise as Monnett taxis the Waiex to the runway. Monnett is now developing small personal aircraft at different ends of the flying world. His new electric airplane at the quiet and efficient end, and his DIY jet at the other. We’re waiting for flight testing to be complete to see a formation flight of the two airplanes at an Airventure in Oshkosh in the near future.